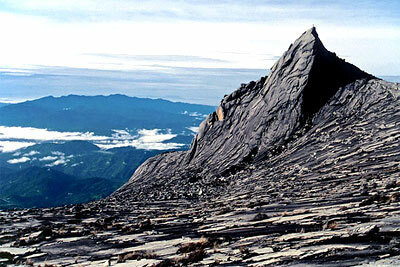 The Kinabalu Park is famous the world over for the highest mountain in South-East Asia - Mt. 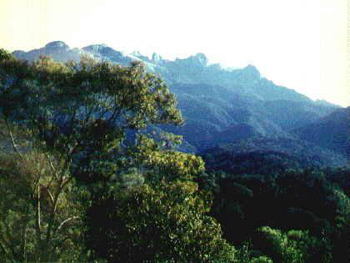 Kinabalu, a Vast jagged granite massif rising to 4,101m. (13,455ft.). The mountain is the focal point of the whole Park which covers an area of 754 sq km (291 sq miles), and includes vegetation types ranging from the rich lowland dipterocarp zone through the montane oak. rhododendron, and conifer forests to the alpine meadow plants and stunted bushes of the summit zone an area that probably has one of the richest flora in the world. If you are a first-time visitor it is well worth your while to go to some of the free visitor programmes organised by the Park. Regular evening slide/film shows and guided trail walks in the mornings are given by the Park Naturalists at the Park Headquarters.Come to the Park Naturalists programmes at Park Head- quarters, they will tell you about the climb and advise you what to take. The programmes are FREE so do take advantage of them. Many people who visit the Park come to climb the mountain, a tough Walk that takes a minimum of two days. But why not take your time over it! The climb can be made far more rewarding and enjoyable if you use three days, with two nights at a mountain hut. This way you can take the time to look at what you pass - the birds, the animals, the rocks and the soil, the views and the almost incredibly rich diversity of plant life belonging to one of the most ancient vegetations in the world. Upon arrival at Kota Kinabalu Airport, meet and being transfer to Mount Kinabalu. 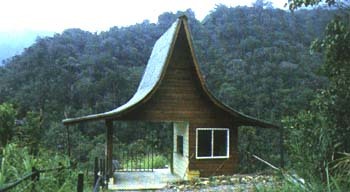 Overnight at the Wildlife Mountain Lodge. 0900hrs Transfer to Kinabalu Park, located at an altitude of above 5000 feet above sea level and the temperature is very cooling (like Genting Highland). Register with Park Officer for climbing. Depart for Power Station. 0930hrs Arrive Power Station (starting point of the summit trail). Trekking will start at an altitude of approximately 7000 feet at Timpohon Gate where you will be trekking for 6 kilometres to reach Laban Rata, which is approximately 11,000 feet above sea level. On the way pass by various vegetation zones with wealth of pitcher plants, birds and other wildlife. Climb is escorted by local mountain guide. **Depending on the individual fitness of the climbers, trekking will take between 4-6 hours. 1500hrs Approximate time to arrive and check-in @ Laban Rata Guesthouse / Gunting Lagadan Hut (whichever available). Free at leisure. **The temperature here is between 10 -15 degrees Celsius. 1900hrs Dinner and have an early night sleep as next day's adventure will start at the early wee hours in the morning. 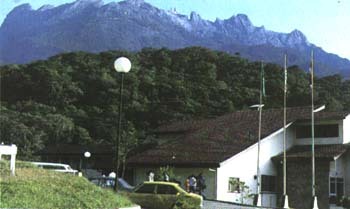 After Breakfast, proceed to a full day tour to Kinabalu Park, visit the Mountain Garden, watch mountain slide show and explore one of the many nature trails in the park. Overnight at Wildlife Mountain Lodge. 0230hrs Have a cup of warm drinks before start of your adventure up to the highest peak. 0300hrs Commence summit trail with torch light which is approximately 2 km. ** Depending on the individual fitness of the climbers, trekkers will take between 3-4 hours. 0600hrs Arrive at summit called Low's Peak, named after the 1st explorer who tried conquering the mountain in the 19th century. You are actually on top of the highest peak (approximately 13,432 feet above sea level) in South East Asia (from Papua New Guinea to Myanmar). Normally (depending on weather conditions), you will see sunrise when you reach the peak. ** The temperature here is below 10 degrees Celsius. 0630hrs Descend to Laban Rata Guesthouse then to Power Station. 1200hrs Approximate time to arrive at Power Station. Transfer to Wildlife Mountain Lodge for lunch. 1245hrs Approximate time to arrive at Wildlife Mountain Lodge for lunch. Overnight at Beverly Hotel. Visit Poring Hot Spring. Trek to the canopy walkway and observe the wildlife from the canopy walkway or enjoy a sulphuric water bath at the spring before transfer to Kota Kinabalu. Overnight at Beverly Hotel. After breakfast, free till your transfer to the airport for your flight back to Singapore. If you are climbing to the summit - a word of warning. Mountains should be treated with respect and you climb Kinabalu at your own risk, The weather can change very quickly from brilliant sunshine, to mist and clouds, to a torrential down-pour. The nights at Panar Laban and Sayat-Sayat are cold and temperatures can drop to below freezing. Ensure you bring enough warm clothes with you and pack them in plastic bags to keep dry. Park Regulations require that all climbers to the summit are accompanied by a registered guide.